Today, I’m sharing a fun project I finished this week. I’m finally in the stages of working on the little ‘details’ of the family room I’m so excited to FINALLY be in this stage because these are my favorite kinds of projects. Quick and easy yet make such an impact. So here is my tutorial on How To Make a Succulent Planter from Thrifted Watering Can. The other day I was shopping at the Goodwill and came across a small and sad looking watering can. Baby E actually pointed to it from the cart and so I picked it up to take a look. She must be taking after her momma! At the time I wasn’t sure what I was going to do with it but an idea eventually popped into my head. I decided to turn this little water can into a rustic inspired planter for succulents. It goes perfectly with the new space. In case you are wondering, there is no real inspiration behind the #2. It just seems to be the standard number I see on cool vintage pieces when I go antique shopping. So I thought I’d go with it. I’m really happy with how it turned out, it’s just another little detail that makes the space feel personal and adds a little charm. I just hope I can manage to keep these succulents alive. I am terrible with keeping plants alive, especially indoor ones. Good thing these don’t need a lot of water. 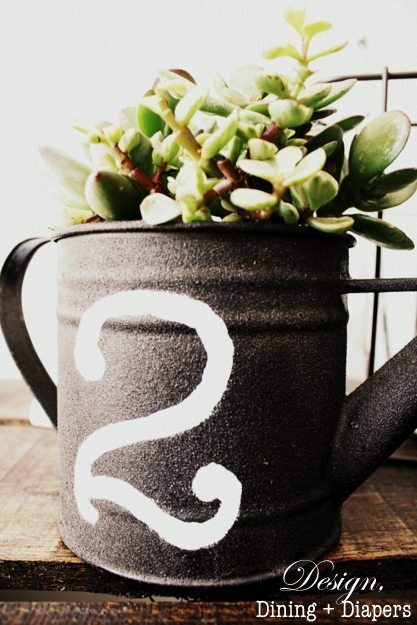 If you would like to turn your own watering can into a succulent planter, here is a little tutorial. 1. Pick out a watering can and give it a good cleaning. 2. I used a Valspar spray primer for the first coat. 3. I always suggest using a primer base when painting metal, it will help your desired paint color adhere and not chip. 4. I chose a Bronzed Metal Metalic Spray from Rustoleum. I love how it went on and I am in love with the color. 5. Next, I used my Silhouette to cut out the number 2 onto a piece of vinyl. I like using vinyl because it generally sticks really well to the surface of the project and then peels off when you are done painting. However, for some reason this vinyl didn’t want to stick so I had to tape it down. I used American Typewriter font. 6. Because the final wouldn’t stick, I was afraid to paint on top of the stencil in fear that it would bleed through, so I used a chalk pen to outline the number. 7. I removed the vinyl and then used a very fine tip paint brush to fill in the lines. 8. My number 2 is complete. 10. Lastly, I planted my succulents and gave them a good watering. I love this! I have a hard time seeing something plain and envisioning something wonderful. I love succulents! What a great idea for a planter. OK, you’ve just answered my prayer about how to transform a watering can I have that is the same color as yours was. I thought about leaving it the same color, but like the rustic metal color instead! The number makes it even cuter. 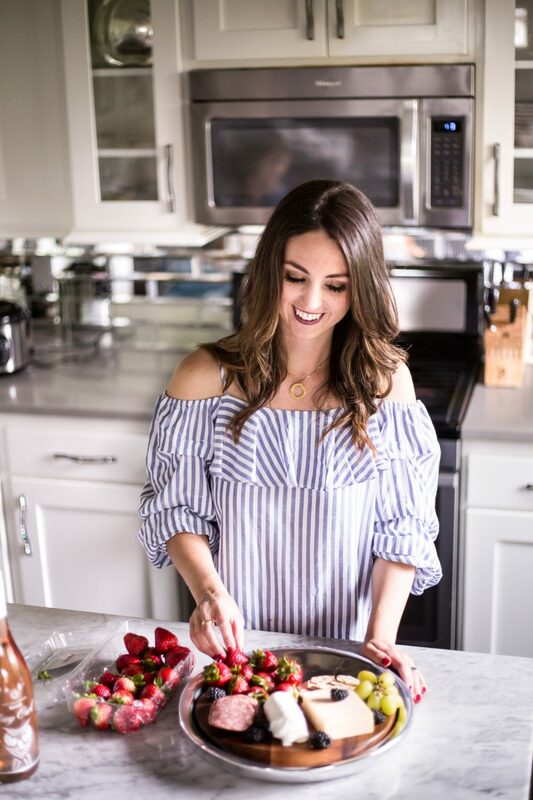 Happy 1 Year Blogiversary, Taryn! Congrats on your Blogiversary!!! 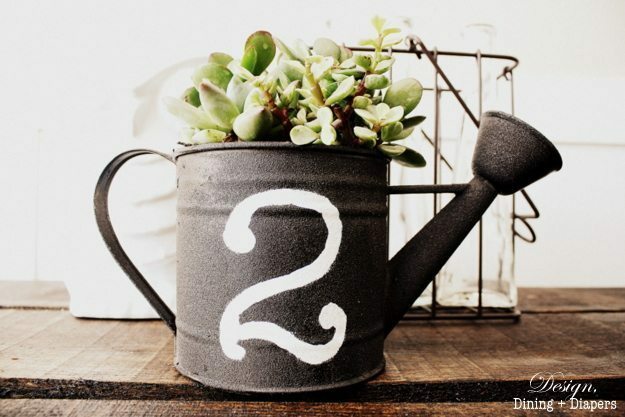 And that watering can planter is just too cute! 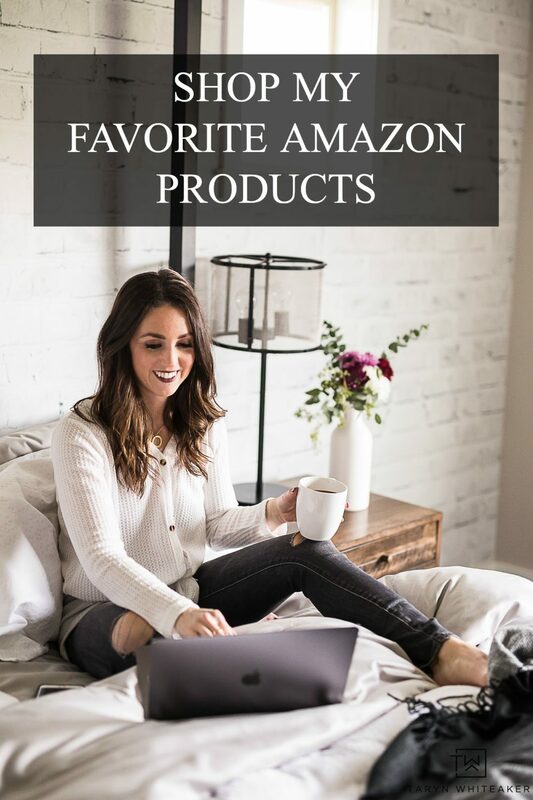 I’d be thrilled if you want to link this up to my link party that just opened tonight! I loooove this! DO you know, I just bought some succulents tonight. Now my plain old glass bowl seems very boring. I think I NEED a watering can! Hey there! I love this idea! I am thrilled to be your newest follower! Thanks for stopping by and liking my facebook page too! Have a blessed day! Congratulations on your bIogiversary! I love succulents and it looks so good in the watering can. I’m pinning this so I’ll remember to do this. Thanks for sharing! Wow this is absolutely adorable! Also congratulations on your 1 year blogiversary! How exciting!!! Hi! This is a fabulous idea! It looks so Pottery Barn-esque. I love it. Great job! I’m your newest follower. 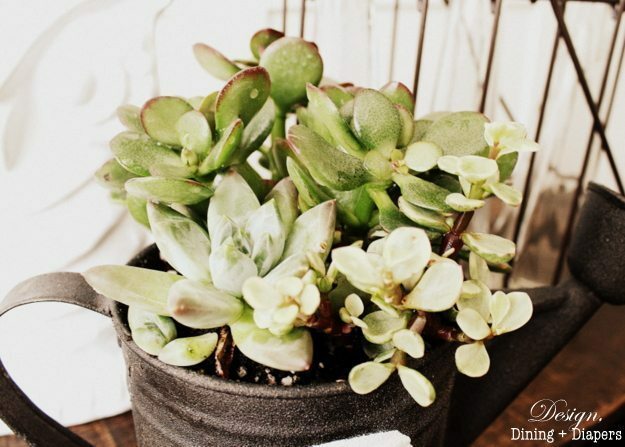 I am really starting to love succulents…they Re so pretty and especially in your cute watering can! So so cute! Cme link up to Centerpiece Wednesday on my blog and share your ideas! I love your planter!! What a fabulous idea! Found you on Delightful Order. Love this!!! Visiting from shabbygals.blogspot.com!! 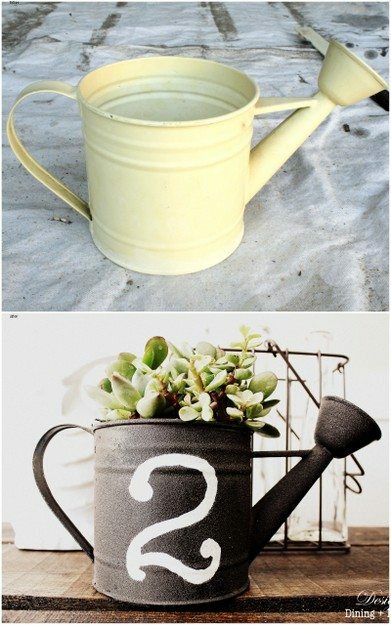 love the watering can transformation!!! glad I found your site! just joined! hop on over to my blog…I have frugal projects you might like!! Totally love what you did with the watering can – I haven’t tried that type of paint before but will now – love this finish of it! Have a great weekend! My grandmother had a watering can much like this one! Thanks for the memory! I love how your project turned out! Thanks for sharing. I am visiting from Tatertots & Jello! Great job Taryn! I love the new life you gave to this! How cute!!!! 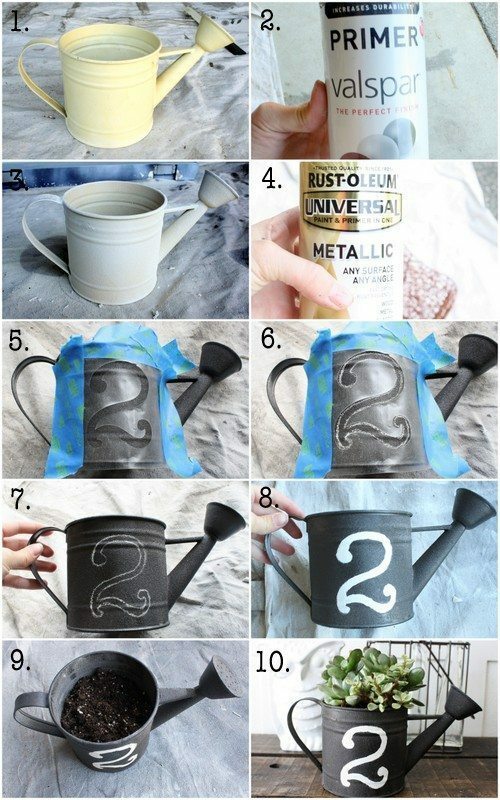 I love pretty watering cans, and I love what you did with this!! So cute! I’m so glad I saw this.I just about sent my watering can to the thrift store, but I couldn’t quite part with it. I knew there was some cute project out there somewhere, and now I know just what to do with it. This is just too cute! I love it! And succulents are one of the few plants that I can keep alive. lol! I live just on the other side of the border from you – I look forward to more of your posts! Love the updated look of the watering can! The succulents look beautiful in it — I just planted my first succulents and have my fingers crossed they survive too :~) Thanks for the fab inspiration! This looks great! We’d love to feature it as a how-to on CraftFoxes.com. Interested? Feel free to email me at bethany@craftfoxes.com. I love anything that has to do with DIY and gardening. This turned out very nice! We’d love to have you link it up at our “Home is Where the Heart is” Link Party! That turned out very pretty! If I could remember to water plants I would definitely have one of those! Now why don’t I ever find anything so cute at my Goodwill? That is seriously cute! I love succulents! Great job! Happy Bloggoversary! I love the can! It is darling! I love this! I just bought my son one of those very same succulent plants yesterday. (He loves gardening) I was wondering what kind of pot I should buy for him and while a watering can might not be the best choice for his bedroom, this helped me think “outside the box” for what I could use. I can’t wait to head to our Goodwill to see what I can find! Thanks! This looks adorable! I love it. Your planter turned out great! I made some hens & chicks planters out of antique cans (gas can and watering can) I love how they look! This is absolutely adorable! So summery and fun. I love the number on the front too! I love the vintage feel of this planter. Very cute! Love this! I just pinned it! Adorable! I will have to try this one for sure, thanks for sharing! Thanks for including the font name, the font choice can make or break it. Well done!